"ISMN" redirects here. ISMN may also refer to Isosorbide mononitrate. 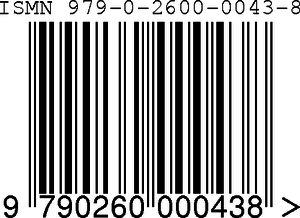 A 13-digit ISMN, 979-0-2600-0043-8, as represented by an EAN-13 bar code. The International Standard Music Number or ISMN (ISO 10957) is a thirteen-character alphanumeric identifier for printed music developed by ISO. The original proposal for an ISMN was made by the UK Branch of IAML (International Association of Music Libraries, Archives and Documentation Centres), put forward by Alan Pope (Blackwell's Music Department, Oxford), Malcolm Lewis (music librarian in Nottingham) and Malcolm Jones (music librarian in Birmingham). A draft ISMN structure and application was presented at the 1987 IAML conference in Amsterdam, then after further discussions at the 1989 IAML conference in Oxford it was decided that the UK, French and German branches should, through their respective national standards bodies (BSI, AFNOR and DIN) file ISMN as an ISO work project. After meetings in Ottawa and Paris in 1993 the draft was finalized and published by ISO. The original format comprised four elements: a distinguishing prefix M, a publisher ID, an item ID, and a check digit, typically looking like M-2306-7118-7. From 1 January 2008 the ISMN was defined as a thirteen digit identifier beginning 979-0 where the zero replaced M in the old-style number. The resulting number is identical with its EAN-13 number as encoded in the item's barcode. The current format comprises four blocks: the prefix 979-0 reserved for ISMNs — at some future date they are expected to occupy the remainder of the 979 space which is shared with ISBNs, a block to identify the publisher, another to identify the item and one final check digit. The TC 46/SC 9 is responsible for the standard. A publication may be assigned both an ISBN and an ISMN. Unlike the ISBN, the ISMN does not segregate publishers by country. To calculate the check digit, each digit of the ISMN is multiplied by a weight, alternating 1 and 3 left to right. These weighted digits are added together. The check digit is the integer between 0 and 9 that makes the sum a multiple of 10. As 85 mod 10 = 5, the check digit is 10 - 5 = 5 and the full number is 979-0-060-11561-5.
which implies that the check digit is indeed 7 (because 123+7=130=13x10). ^ "IAML", Newsletter (10), ISMN International . ^ What is, ISMN International . Fripp, Robert (2011). Pozzo, Horacio, ed. Seven Guitar Craft themes: Definitive scores for guitar ensemble. "Original transcriptions by Curt Golden", "Layout scores and tablatures: Ariel Rzezak and Theo Morresi" (First limited ed.). Partitas Music. ISMN 979-0-9016791-7-7. DGM Sku partitas001.